"The experience was incredibly empowering. We learnt that every person can make a difference and speak up for the voiceless." 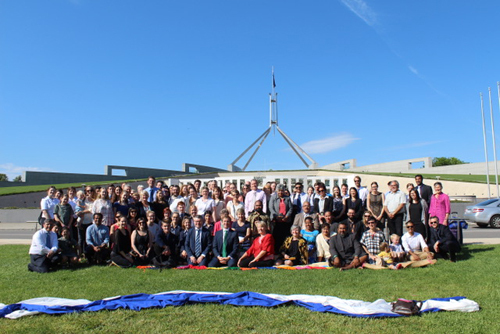 RAISING THEIR VOICES: Participants at Voices for Justice gather with MPs in front of Parliament House to call for more action on the issue of climate change. We headed off from Western Australia with little more than a vague notion of what we were about to do. Recent marches in protest of the government’s treatment of refugees, and sending emails and letters to our local MPs resulted in us taking action and joining the voices of other Christians in Canberra. I had heard about Micah at the time of the millennium development goals and knew that they stood for social justice and alleviating poverty. We had no idea how much we were about to learn in the space of three days. The talks were many, the people passionate, and the topics at times overwhelming, sometimes uplifting, sometimes shocking. The timetable was demanding, especially for the first-timer who was coming in inexperienced in the ways of politics and how to approach MPs and senators. The experience was incredibly empowering. We learnt that every person can make a difference and speak up for the voiceless. We had an inspiring lobby group who were full of wisdom and included two young brothers who attended all our meetings with politicians and their staffers. We were especially impressed by the older of these boys who, at the age of 12, spoke up for his generation and made his voice heard in our meetings. The number of youth present at the gathering was awesome, and their knowledge and enthusiasm inspiring. We were impressed by the number of young people who had been coming to the gathering for many years. We learned that deep down politicians are human too, however, are sometimes hamstrung by party politics. They do have a heart and are approachable and willing to listen. This experience has empowered us with the confidence to stand up and make our voices heard on returning to Perth and to our respective electorates. The experience has enabled us to put our faith into action, and we have returned home with support to sustain and implement this action.